WHAT ARE THE CAUSES OF DOUBLE CHIN? Ageing, genetically predisposed and weight fluctuations can all influence submental fat causing ‘double chin’. The injections can be used to reduce fat in this area to reduce the appearance of a double chin. 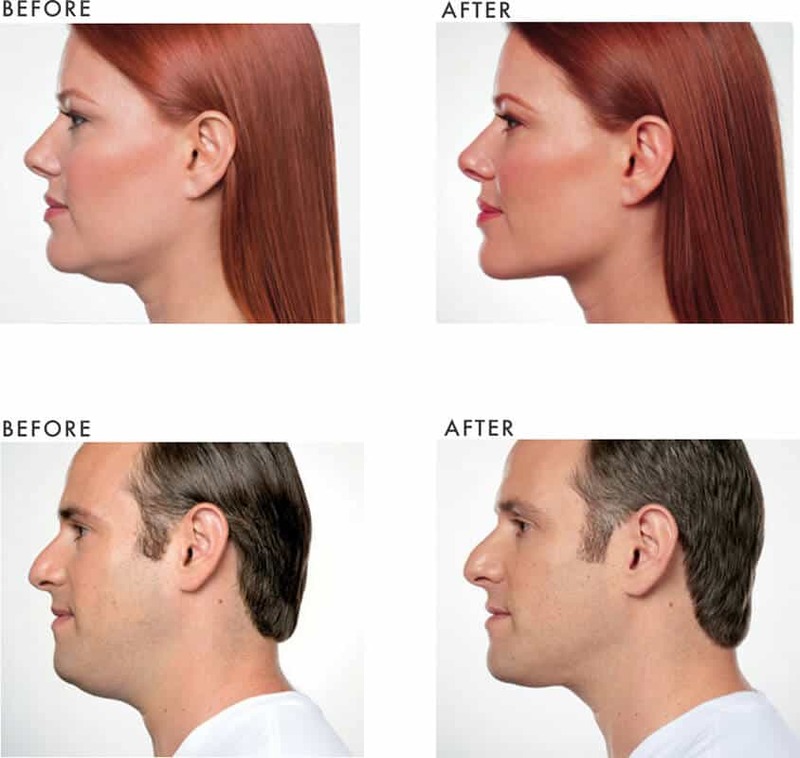 Treatments create the effect of a ‘chiselled jawline’ which is desirable for men and women. Research has shown 59% of women and 41% of men would like to improve their side profile by treating submental fat. The injections contain a substance that occurs naturally in the body and aids the breakdown and absorption of dietary fat. Due to TGA restrictions we are unable to mention the active ingredient, however you can contact the clinic for more information. When injected into neck fat below the chin, the injections disrupt the membranes of adipocytes (fat cells) leading to irreversible cell breakdown. The body then absorbs the fat through natural bodily processes. There is a mild local inflammatory response which is largely resolved in approximately 28 days. New collagen is produced in the area helping to ‘plump’ and firm the skin. Clients will require a face to face consultation with Dr Alexander to ensure they are suitable for the treatment. 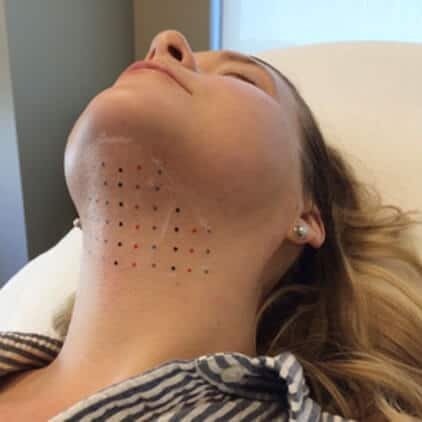 The client will be cleaned and a grid will then be applied (see below) which will allow the doctor to find the correct dosage for the individual, and help cost the procedure. The client is then injected. A local inflammatory response will occur in the submental region. A cold press is applied for 10 minutes immediately following the injections to reduce/minimise swelling and redness. The treatment including doctor’s consultation takes approximately 30-40 minutes. Gas will be offered to clients during the procedure to ensure they are comfortable. Results may not be visible for up to 6 weeks, and may not be visible until after the second or third treatment. Skin continues to tighten after treatment even after swelling subsides. An appointment is arranged for 4-6 weeks after the treatment for review and to determine is follow up treatments are required Panadol is suitable for home pain relief, anti-inflammatories should be avoided as the inflammatory response may be an important part of treatment success. Pain, bruising swelling, redness and numbness are common, some patients experience bleeding, induration (areas of firmness) and itching and paraesthesia. Rare side effects include nodules and transient neuropraxia of a facial nerve which causes smile asymmetry. Consumer information is available in clinic.